A Successful Future Awaits You! 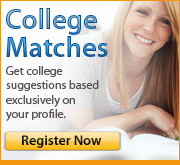 Does the whole college planning thing sound a bit overwhelming? Of course it does! But, rest assured that it isn’t nearly as hard as it sounds and you are not alone. Know that your friends and classmates are facing the very same concerns as they look toward the future. Know, also, that My College Options®—your FREE online college planning service—is here to help you navigate the maze of college planning issues and help relieve your stress during your college search. The first step in college planning is allowing yourself to see going to college as not just a dream, but an option that is a very real possibility for you. Let yourself dream a bit. Try to picture your life ten years from now…what you might like to do…your lifestyle… What do you see? It is never too early to begin thinking about your future. Dreaming does not require you to know what you want to do for a living or what major you should choose if you go to college right after graduating from high school. To dream is to imagine, to hope or long for, or aspire to something, creating pictures and ideas in your mind of what could be, regardless of present conditions or circumstances. Therefore, one might say that college and career planning begins with your dreams for the future. The next step in the process is awareness…self-awareness and becoming aware of your options, as well as becoming aware of what it will take to achieve your dreams. Self-awareness is essential if you are to make wise decisions at the end of the college and career planning process. Why? The answer is: because this is your life we are talking about and you are the focus of the planning process. If the options you choose to explore and the goals that you set to achieve your dreams are to be realistic, you will need to know—realistically-- who you are, what you like and do not like, what you can and cannot do, and what help you will need along the way. Aid you in understanding the college admissions and financial aid processes. Armed with this knowledge, you will be well-equipped to make wise decisions about your future. You will encounter the word “process” often as you explore your post-high school options. There is, first, the process of choosing high school courses and activities that will position you to achieve your goals and dreams; then, comes the college search process, the college application process, the financial aid process, the college selection process, the college enrollment process, all taking place while you are in the process of moving from adolescence to adulthood. All of this will happen during your years in high school and each one will take time and effort on your part. Remember that awareness is the key, at this point, and that time is on your side. Just take things step-by-step. You will be amazed at the outcomes.